It's that time of year again where everyone starts really getting into the holiday cheer. Christmas' for our family will never be the same and this year was especially a little harder. I didn't like it when strangers asked if I was excited for Christmas in their over enthusiastic ways. I felt awkward to be forced to lie in response with an equally yet sarcastically enthusiastic "yes" to avoid having to share personal information. My family did follow a few original traditions from previous Christmas': crab legs for dinner with butter and garlic sauce (delicious) and opening presents on Christmas Eve before going to the late service at church where we all would sing and play our instruments from the balcony. I always felt bad for mom in the past for having to sit down in the pews alone because my dad, brother and I were so busy being "musical" every year. She never complained though. Korea was a big disappointment and I had my few days of sadness over it, but distracted myself with packing and going over to watch friends wrap presents and make goodies for their family events. I can't change how things panned out but I did learn a lot about teaching in Korea, China, and Japan in the process of getting ready for Korea. Remember I was going into the Peace Corps to teach ESL and I haven't lost that passion. You can make a lot of money in Korea teaching, most people I've talked to were taking some intense "vacations" that went everywhere in the world just from the money they saved working in Korea. It's definitely something I'll look into for the near future. I just will never work with those recruiters, or any recruiters again. The day after I found out I wasn't doing things as planned I tried to make new ones immediately. I had no intentions of staying in Point a day longer than originally planned. However, with this new change I ran into various problems that require me to flexible to work around, as well as other people. I'm coming a month earlier than expected so some people in Alaska now have to be super accommodating for my change of plans. I won't be stuck on the streets so at least that's nice. Since I'm shipping my stuff I will only have whatever I can fit in a suitcase and a day pack for three weeks, and that includes interviewing clothes and that warmer stuff for the Alaskan winter... a lot thicker than what I would've taken to Korea so that's been hard to plan and pack. The greatest thing of all that really makes moving to Alaska a great choice is I already have a small group of individuals willing to meet and show me around, go hiking, ice climbing, have coffee, the works. And they are all strangers. I met them from couchsurfing.com and some have been so nice to the extent of offering to pick me up from the airport. I also noticed a lot of people are traveling a lot right now in crazy destinations from Peru to Scotland. So I'm moving to a place where people are interested in seeing the rest of the world (like me) yet are passionate about the place they live in. It doesn't surprise me that the very person who coaxed me into moving there I met when I was traveling. Everyone's an outdoor enthusiast there. Matt of course will help me settle in but since his work takes him to Juneau I'll be on my own after the 6th of January until I can yank him on a coastal road trip throughout the west coast. It's nice to have crazy friends who suggest crazy ideas like that. But in the mean time I will have good company to explore the city and outskirts with. Ice climbing is the first big thing I'm going to tackle. 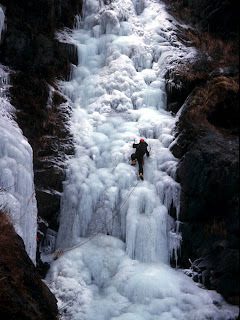 There are frozen waterfalls just south of Anchorage that people go to climb. This picture will be me in possibly a month. I will be spending my remainder days in Wisconsin hanging out with friends as most have flocked back home for the holidays, sledding in our freshly fallen 9 inches of snow, and savoring my last moments with the piano, car, and precious animals. There is a marathon of documentaries about Alaska on the travel channel all day today, most by my oh so favorite host Jeff Corwin: all signs point to Alaska. Hope everyone enjoyed their Christmas and Solstice celebrations. It's a slow day at work today, so I have little else to do but keep up with my good buddy's goings-on. I'm really excited for your move! It's much sooner than I thought, so I might not see you before you go! SAD. But also HAPPY because Alaska is going to be awesome for you. I can't wait to hear what kind of things you're doing there. Seriously, I wish you the best and I can't wait to plan a vacation to Alaska to see you (and the beautiful scenery). Best of luck Amanda, and yeah, Alaskan winters are strange. When I was in Anchorage and Fairbanks, it was between 85-90 degrees in January. I can't believe you'll be leaving in a couple days. We better get out in all that fresh snow to play before you go. I'm sure you'll have plenty of it in Alaska but I want to have some good ol WI wintertime fun with you before you leave. Speaking of snow: we're getting some more this weekend. Our little trek to Chicago may become an adventure.